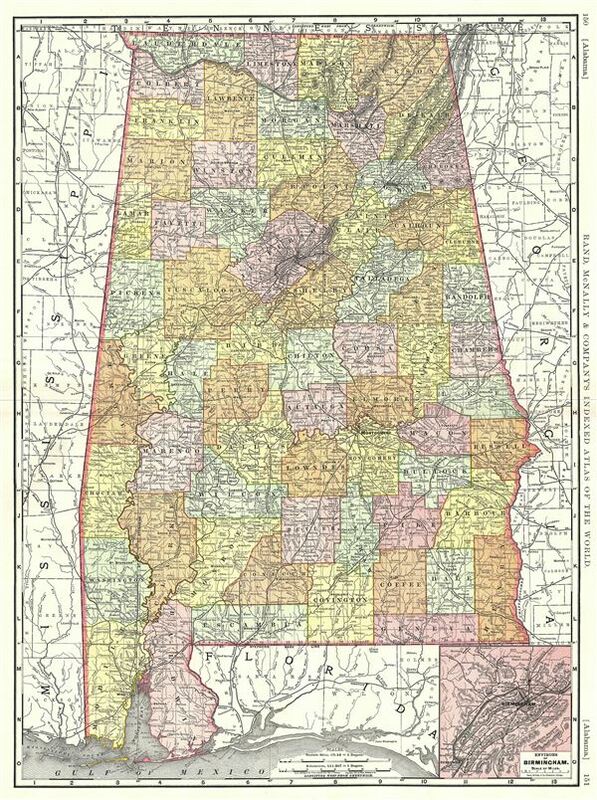 An attractive 1892 map of Alabama issued by Rand McNally and Company. Centered on Birmingham, the map covers the entire state in great detail. An inset map of the environs of Birmingham in included in the lower right quadrant. Major cities, towns, rivers, railroads, and other topographical details are noted throughout. Relief is shown by hachures. This map was issued as plate nos. 150 and 151 in the 1893 edition of Rand McNally and Company's Indexed Atlas of the World- possibly the finest atlas Rand McNally ever issued. Rumsey 3565.096 (1897 edition). Philips (atlases) 1026 (1898 edition).